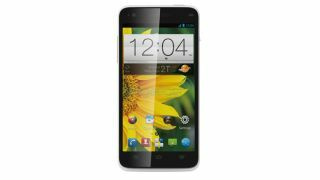 A press shot of the heavily-touted ZTE Grand S smartphone has appeared online, two weeks before its launch at CES. The handset will be competing for attention against a raft of fellow 5-inch, full HD 1080p displays when it officially arrives in Las Vegas in the second week of January. The company has been teasing the arrival of the flagship Grand S by posting sketches on its Sina Weibo account, but Engadget has now picked up an official-looking shot from an anonymous tipster. Not a huge amount is known about the other specs for the phone, beyond the display, but a note on the CES website refers to the as-yet-unnanounced Grand S as "the world's thinnest for 5 inch FHD smartphones." It seems that the trend towards 5-inch, full HD smartphones will dominate the annual tech extravaganza in the desert. The likes of Sony, HTC, Sharp, Lenovo and Huawei are all thought to be preparing big-screen 1080p phones.